At hydrograsscorp.com we are here to help you find the financing solution that best suits your business needs. Whether you need to defer payments or finance for as long as six years we can help you find what you are looking for. Concerned with having less than perfect credit or no credit? Give us a call today and we will try to help. *hydrograsscorp.com offers these choices to you as a convenience only. The finance companies listed below have no affiliation with hydrograsscorp.com. As in all financial transactions please use due diligence. Knowledgeable Wells Fargo Equipment Finance Sales Force with an average of 20 years equipment and equipment finance experience. 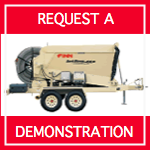 As an award winning distributor of FINN Equipment in New England & New York, hydrograsscorp.com offers both new and like new pre-owned equipment, rental units and an array of thoroughly tested and proven consumable products including fiber mulches, fertilizer, grass seed mixtures, Finn consumable products and erosion control blankets. hydrograsscorp.com also offers authorized Finn Equipment service and winter storage at our locations in Maine and New Hampshire and have multiple mobile units for road support as well as a fully stocked parts department. The hydrograsscorp.com team is committed to providing the best products and service in the green industry.